Motorcycle riding is not only a means of just a travel for the riders. It is in-fact a passion and hobby for adventure sports seekers. In Indian context, It is an adventure to the next level when you are on an expedition on your motorcycle. The ride offers magnificent view of snow covered mountains of Himalayas, deserts of Rajasthan, heavy rainfall Cherrapunji to cruising along the coastal lines of India. If you are a true motorcycling freak, take out your motorbike and set out for the journey for Leh-Ladakh from Khardung La. And trust me!, you never had done adventure like this before. The twisting roads, weather and the views on both sides of the path will mesmerize you. Surrounded by mountains, Khardungla Road is famous for being the world’s highest motor-able road. Passing through this track, you will get an opportunity to have a closer look and feel of Buddhist culture. The best time to cruise on this road is between April to August. If you still have the heart to roam, then Spiti Valley of Himachal Pradesh is not far away from Ladakh. The adventure motorcycle journey to Spiti Valley passes through beautiful places like Kaja, Tabor, and Pin Valley. Near Baspa and Kinnaur, the stretch is full of apple and apricot trees line-up on the sides of the roads offering a visual treat for the bikers. The drifting Sutlej River flows along this beautiful road track. The snow covered temples on this adventure journey will let you experience an immense peace. The best time to travel on this road is between April to October. It is another stretch which is considered a dream route for adventurers. This beautiful road passing through Kerala and Tamil Nadu and connects Polachchi of Tamil Nadu to Chalakudi of Kerala. While driving your motorcycle, you pass through beautiful views and dense-lush green forests. This area receives heavy rainfall, due to which many small and beautiful cascades can be traced on the route. The journey has two waterfalls – Athirappilly and Vazhachal not to be missed. The road is motorable and safe all through the year. A motorcycle trip from Mumbai – the commercial capital of India to Goa – a former Portuguese colony is again, quite interesting. Journey enthusiasts and adventure bikers find it similar to U.S. Highway 101. This road is considered the best for biking in the coastal areas of the country. Adventure bikers can highly enjoy this 10-hour journey which is also used in many Bollywood flicks. The best time is from October to February to enjoy this journey to the fullest. The Western Arunachal Pradesh can also be a memorable bike trip for the adventure riders. It is a breath-taking experience to ride a motorcycle gazing at the high peaks of the Himalayas. The condition of the road is not very good, and it is a very adventurous journey through the uneven mountain terrains. The road trip lets you enjoy a drive through the snow covered narrow roads. The trip also offers you a closer look at the tribal culture and a different lifestyle of eastern India. This journey also needs you to get an Inner Line Permit (ILP) applicable to Indians as well as Foreigners who enter Arunachal Pradesh State of India. Guwahati to Tawang is a long and tiresome journey of around 510 kms. So, you need to break your journey to 2-3 halts before the final destination. The best time to visit this place is from March to May and from October to November. You can never forget the feeling of riding a motorcycle on a dust-laden highway passing through a desert. In this adventurous 600 kilometres long journey there will be many moments to witness the culture of Rajasthan closely. The in-between places like Jodhpur, Osian, and Pokharan provides opportunities to see beautiful locations and enjoy mouth-watering delicacies. The villages along the road flourish with life. And most important of all!, they shower you with their hospitality. The famous Kumbhalgarh Wildlife Sanctuary also falls on this route. 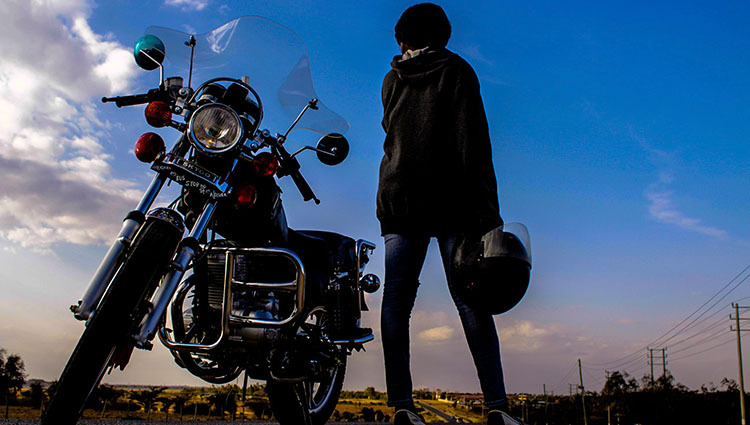 The best time to enjoy the motorcycle trip is from February to October. Gujarat, another colourful state of India, is not very far from Rajasthan. This state also offers some excellent desert ride routes for motorcycle enthusiasts. The sand spreads all around like a white sheet of cloth all around filling you with a different level adventure. You cannot apply sudden braking on the sand-laden roads of this route, and It requires a lot of caution. It feels great to ride a motorbike here at night. This is because sparkling sand particles makes you feel as if you are driving in the sky full of stars. The best time to plan this trip is from December to February. While passing through the valleys of eastern Himalayas, the bikers can enjoy and cruise along the beautiful Himalayan railway toy trains which now figures up in UNESCO world heritage. This route showcases the amalgam of Hindu and Buddhist culture in India. The beautiful views of Kanchenjunga- the third highest mountain peak in the world en-route is a visual delight. The stretch between Darjeeling to Gangtok via Pelling is also popular among motorcycle riders. The place can be visited any time of the year. The bike trail on this trip lets you discover two very different climate extremities. This is because on the one hand Shillong is known for high peaks and uneven terrain, Cherrapunji receives one of the highest rainfall in India. Not hard to guess, a motorbike journey between chilling cold climate and rain showers is like a romantic adventure. The change in climate requires a careful rider although. The best time to visit this place is between October to March. This article was written by Himanshu Jha, the founder and editor of reviewtalks.com. He loves to blog about cars, motorcycles and automobile topics.